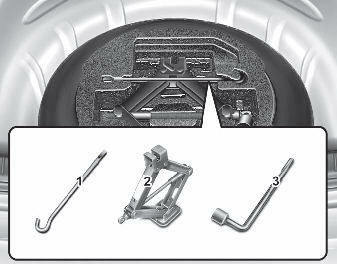 The jack, jack handle, and wheel lug nut wrench are stored in the luggage compartment. Pull up the luggage box cover to reach this equipment. To prevent the jack from “rattling” while the vehicle is in motion, store it properly. Always move the vehicle completely off the road and onto the shoulder before trying to change a tire. The jack should be used on level firm ground. If you cannot find a firm, level place off the road, call a towing service company for assistance. The vehicle can easily roll off the jack causing serious injury or death. No person should place any portion of their body under a vehicle that is supported only by a jack; use vehicle support stands.